We at the Group Real Estate, a small real estate brokerage, doing big things for Southeast Idaho Real Estate, love to talk about the video games that we love. There are some of us who are a little more invested in gaming and those of us who just love the occasional video game or playing socially. I tend to be about in the middle with this. If a game comes out that I truly have been looking forward to playing, then I will go the route of wanting to get it, pay it off, reserve it, etc. I have recently shared my Xbox with a friend of mine so that any game I get, he can play, and any game he gets, I can play. This helps the social side of gaming so much as he is the friend who I engage in playing with. Recently, Battlefront II came out. The sequel to Battlefront. The Star Wars game that was all online and wonderful. This one added a campaign and changed a few things up, to improve, although there is a lot out there of whether or not that is true. As I have started into the campaign, it is truly a silly story line. 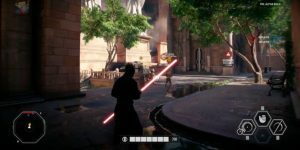 It just moves forward to cram in what it can to help you know how to play each and every character, and game style, from guns to lightsabers, as you go through the silly story line. But it does let you play as characters like Luke Skywalker and Han Solo, and fly the Millennium Falcon. This is wonderful for anyone who has any kind of nostalgia for Star Wars in their lives. 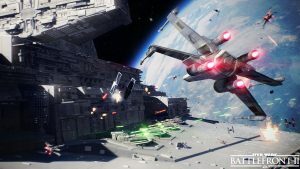 I have yet to play online, aside from the beta that I wrote about awhile back, but I have heard so many different things about the play, the level up system, etc. I am excited to dive into it at some point with my friend, though. Now, the main reason I went with this one, even with the bad reviews thus far, was how much fun it has been to play as all my favorites. the story actually starts off really cool, playing at the end of the events in Return of the Jedi, to where your Imperial character is down on Endor when the Death Star explodes. In a weird turn of events, you just decide to turn to being a Rebel and defy your father, who is one of the only living Generals in the fleet left after the Death Star is taken down. It’s very abrupt and very dumb. But done so that you can experience playing as all the heroes, from Han Solo to Princess Leia. Then coming back to the main character, only as a good guy now, going after your father. Sometimes in games like this, that have a very weak story, I would pass. On my all time favorite games, I love playing them because I want to be a part of the amazing story line and go forward with the characters that I have learned to love. If this was only a campaign, I would make sure to tell people not to get it. However, if you love Star Wars, and you love the characters of Star wars, you will love this game, for that exact reason. It is a blast to play as these characters. As far as the online play goes, I am excited knowing that I will get to play with my friend, as that is how most online games go, as I don’t have a lot of time to devote to playing games for hours and hours, to level up and become amazing. So, I get online to play with my buddy, have fun listening to all the noises, sounds, soundtracks, character work and lightsaber noises… even if I am killed off every couple seconds.